Hosted by Center For New Americans and Shea Theater Arts Center Sunday, April 7, 3:00-5:00pm Shea Theater Arts Center, 71 Avenue A, Turners Falls, MA Tickets: $10 at the door or online. 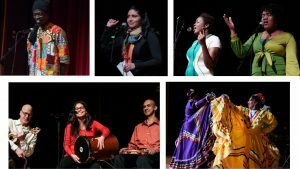 Immigrant Voices: A Celebration of Arts returns to the Shea Theater. In celebration of immigrants’ artistic contributions to W. Mass, this event showcases Center for Americans’ students, alumni, and friends. Performances include dances from Mexico, African drumming, songs from Iran, El Salvador, and Bulgaria, and poetry from around the world, and is directed by Marilyn Sylla. General admission tickets are $10 and available online at www.cnam.org and at the door. Donations and sponsorships of student tickets are gratefully accepted.